I tripped over this free game on the marketplace called Tangled Birds developed by ‘Code From Home’. It is a pretty fun game that does not take it easy on you at all. All you have to do is untangle the birds from the the tangled rope, which sounds easy enough. Except for the fact that birds keep on appearing and it can get pretty confusing at times. It is a pretty entertaining game though and it is all free. 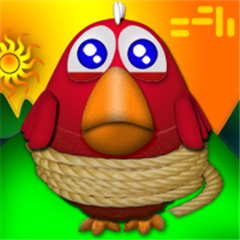 These cute birdies are all tangled up and need your help to break free. Do you have enough skills to record your name on our leaderboard? This is a great game to pass time and offers a casual mental challenge. The marathon of never-ending birds in distress will keep you playing for hours. How many tangled birds will you set free? added level selector to jump straight to a cleared level. Fixed crashing issue when running in French locale. Fixed all crashes reported by players. Made it easier to change name before submit score. Thanks to all our players who sent valuable feedback. We’ll keep improving the game based on you comments and suggestions. Written by: Hyde13 on January 3, 2012.